Don't have a lot of time to workout? Try this 10-minute HIIT (High Intensity Interval Training) workout! It's guaranteed to get your heart rate up and torch some serious calories in a short amount of time. All you need for this workout is your sneakers, a stopwatch, a bench or chair, and a little bit of space. Don't have a lot of time to exercise? Try this 10-minute HIIT (High Intensity Interval Training) workout! It's guaranteed to get your heart rate up and torch some serious calories in a short amount of time. All you need for this workout is your sneakers, a stopwatch, a bench or chair, and a little bit of space. 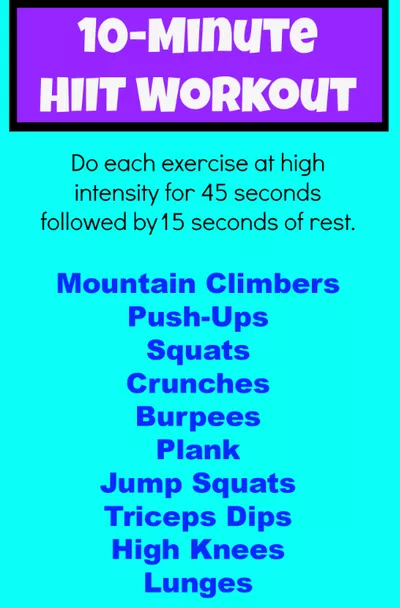 Do each exercise at a high intensity for 45 seconds followed by 15 seconds of rest. Keeping up the intensity is key to this workout, so make sure you're really pushing yourself during those 45 seconds. But, of course, work at your own pace and rest as needed. Have more than 10 minutes to exercise? Repeat the entire circuit two or three times for a 20- or 30-minute HIIT workout.